Crimson Peak (2015) | Who Killed Orrin Grey? I saw Crimson Peak over the weekend, because of course I did, and it’s taken me this long to get a chance to sit down and try to write out my feelings about the experience, even though they’re really not that complicated. It’s difficult to think about Crimson Peak on its own terms. It’s tough to step back from it, look hard, and judge it as just another movie. 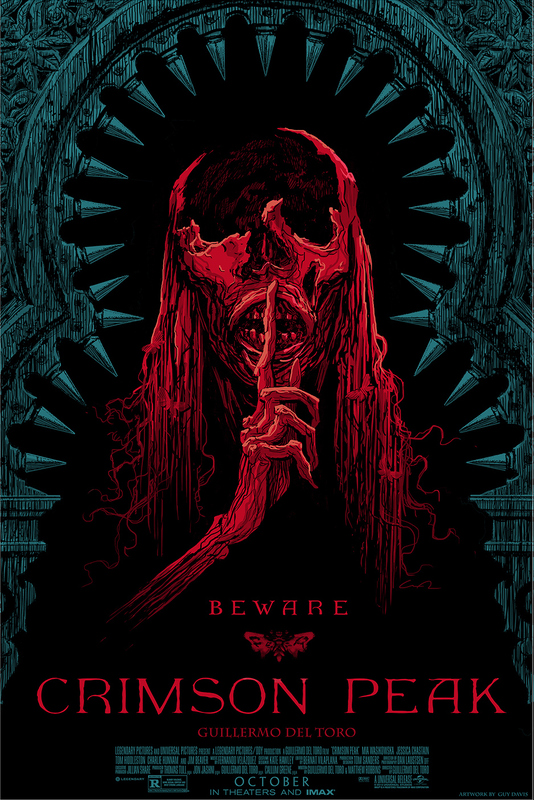 Luckily, Crimson Peak is pretty damn good, even when you try to just view it on its own merits, and all of the people who are complaining or wringing their hands or just warning everybody else that it isn’t particularly scary may have the best possible intentions, but ultimately they probably haven’t been paying attention. Guillermo del Toro has never made a scary movie, and while Crimson Peak may seem like the most likely candidate to break that streak from the outside looking in, he isn’t about to start now, nor even try very hard. Which is not to say that Crimson Peak isn’t effective–it absolutely is–it’s just not effective at being scary, because that’s not really what it’s attempting. In place of the usual mechanisms of even a particularly good scary movie, Crimson Peak rests on a sense of inevitability and decay and dread. If you’re willing to take that instead, you’ll do just fine here. The thing that struck me the most upon walking out of the theatre is how much Crimson Peak resembles Del Toro’s other Gothic ghost movie, The Devil’s Backbone. The resemblance is so uncanny that I made the claim that Crimson Peak was essentially a remake of Devil’s Backbone with a bigger budget, but that’s not really fair at all. A more accurate way of putting it would be that Crimson Peak is built out of all the same Legos that made up Devil’s Backbone, but Del Toro has used them to build a very different house, one constructed on the foundations of the Gothic romance where Devil’s Backbone had its feet firmly planted in the boy’s adventure genre. Their themes and preoccupations, however, their uses of ghosts and what ghosts mean, are cut from the very same cloth. Given that Devil’s Backbone remains my favorite of Del Toro’s Spanish-language films, this is by no means a bad thing. Oddly enough, Crimson Peak is also of a piece with Pacific Rim, albeit in a very different way. As in Pacific Rim, Del Toro is letting the tropes and trappings, the very familiarity of the genre, do the heavy lifting for him here, so that he can put his energy into other concerns, generating depth of meaning through visuals and motifs, as much as–or more than–plot or dialogue. And like Pacific Rim, Crimson Peak marries the confidence and control of Del Toro’s Spanish-language filmography with the visual splendor of his Hollywood blockbusters. It also works as a love letter to the genre, filled with nods both oblique and overt, and moments of stunning beauty and dread. The only real complaint that I can muster against Crimson Peak is that–for all its splendor–it feels slight. Where Del Toro took the very familiarity of Pacific Rim and used it as a shorthand to jam the movie full of enough stuff for any three movies, here what we get is a very good (and very brutal) Gothic romance tale, but nothing more. Maybe it’s because Crimson Peak looks so big, so grand, that we’re left expecting something equally big and grand from the story, and what we get is simply what we should have expected all along. There’s nothing whatsoever wrong with Crimson Peak or its climax, but it’s also the climax that we all knew was coming. It’s hard to look at Crimson Peak and feel anything but gratitude that we got a movie like this at all, just as it’s also hard to look at it and not to long–at least a little bit–for something more.